Most basketball fans remember the famous sentence that Rasheed Wallace often repeated during the games: “ball don’t lie.” This post’s title should be a reminder of that sentence. As a matter of fact, this article talks about the role Artifical Intelligence (AI) can play in basketball. Even though I never wrote an article on AI specifically, I did mention it in some of my previous posts—see, for instance, this one. This time, I’ll talk in detail about a way this technology has been applied to the game of basketball. That is, the HomeCourt™ app, of which I had never heard until my friend Davide told me about it. I have recently tested it myself, and I think it will get all the players and coaches really excited! But what is HomeCourt™? 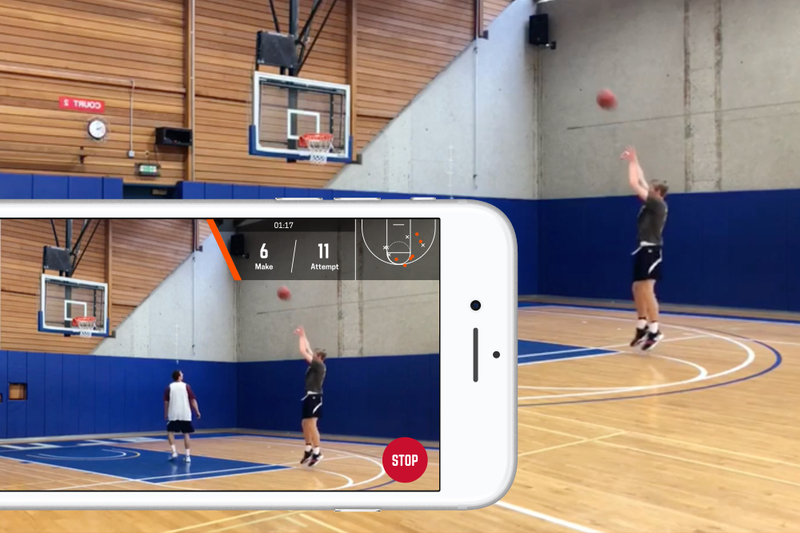 In essence, it is an app that makes use of the smartphone’s camera to count in real-time the shots—made and overall—you take during a shooting workout session. In addition, it tracks the spot from which you take every single shot in order to produce a shooting chart. When I watched the clips on the official website, I was shocked! I realized immediately the potential that such an application can have on basketball players, even for non-professional one, like myself. In short, I had to get this app! Unfortunately, it is available for iOS only at the moment. For what concerns software programs and electronic devices, I generally dislike closed-source, proprietary implementations because I find them anachronistic. We live in a world that is going in the opposite direction since the demand for integration has reached unprecedented levels. Furthermore, fully closed-source systems are kind of suspicious because you’ll never know what’s behind the scenes. All of this makes the need for open and interoperable systems practically mandatory. For these reasons, I thought that I would have never bought an Apple product in my life but, as they say, never say never … Reluctantly, I had to cross the border of what my friends who own an iPhone call “the dark side”: I bought on eBay a second-hand iPhone 6S for less than 200€, as this device is the minimum requirement to run the HomeCourt™ app. In the meantime, I got in touch with HomeCourt™ customers’ service as well. Luckily, they are thinking about developing an Android version too. The app is very simple to use. Once you install it and create an account on the HomeCourt™ platform, you just need to set it up properly as described here. Before starting the workout, you can also pair the iPhone to a Bluetooth speaker and to enable the “Count Out Loud” option. This way, you’ll hear clearly a voice counting out loud the shots while you are practicing. I found this option very convenient. It is worth remembering that the app can count up to 300 shots per month unless you pay the monthly fee of 8.49€ (at least for now). My very first workout session consisted of 100 shots. The resulting shooting chart is shown in the following image. In accordance with my opinion about the use of 3-point shot in modern basketball, I took no three-pointers on purpose. After ending your workout session, the app uploads all the data, including the footage, to the HomeCourt™ cloud. Each and every shot, no matter if made or missed, can be reviewed individually in either normal or zoomed mode, shown on the left and right side of the following image, respectively. Moreover, you can loop it or play it in slow motion. Another interesting statistic is the zone shooting percentage. The court is divided into different zones as shown in the following picture. This is very useful to determine where you need to improve the most. With regard to these zones, I find extremely helpful the time chart feature: it shows, zone by zone, how your percentage changes over time. For instance, let’s say you decided to change your shooting form to imitate the famous Steph Curry’s one motion shot, but you are not sure if this is the right form for you. This tool allows you to check if it actually works or if you should go back to your old mechanics, thanks to the fact that you can see how your shooting percentage changes after you adopt a new shooting style. Data of your shooting sessions can be shared with the HomeCourt™ community. You can also create teams and compete with other people. I have not tested these features, though. At the end of this testing, I decided to subscribe to the “No limits” platform for which HomeCourt™ provides a 2-week free trial period. What I described so far is just the beginning as the best is yet to come. More advanced analytics will be available in the future as anticipated in this article. I can’t wait to test these new amazing features! By the way, in case you are wondering how I felt when testing this app, the answer is: yes, I felt like I was an NBA player for a day! … and for the individual shots as well. The availability of Shot Science makes this app even more awesome! I wish to thank very warmly my friend Danny who kindly reviewed this post.